For those of you looking for a way to enhance your kerb appeal whilst simultaneously heightening thermal efficiency by building an effective barrier against extreme weather conditions, cladding the outside of your home could very well be your best bet. There are a number of materials to investigate, so today we thought we’d take the time to address the most popular cladding types; HardiePlank® & Stucco. In Britain, Stucco is most widely known as render and is generally used on the outside of buildings to cover less visually appealing construction materials. Applied wet, traditional stucco is made from lime, sand and water and can be applied in 3 layers with the addition of a reinforced lattice or in one or two thin layers directly on to the surface. Modern stucco is made from Portland cement, sand and water and can be applied as one base layer and a finished layer which must also be reinforced to prevent cracking. 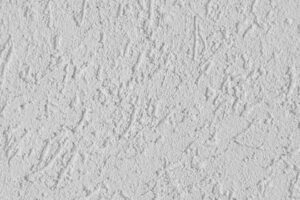 Additives such as fibres and synthetic acrylics are also added to modern stucco, for strength and flexibility purposes, e.g. the “pebble dash” effect. Available in different colours and textures, fibre cement cladding is constructed from composite materials made from cement and reinforced with cellulose fibres. Safely replacing asbestos in the 1980s, this combination of cellulose fibre, Portland Cement, sand and water offers an outstanding cladding solution that is fire, water, mould, UV and pest resistant. It doesn’t rot, warp or crack either. 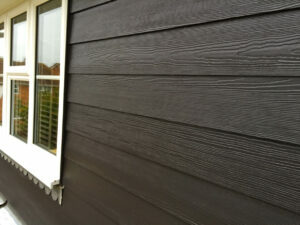 Is Stucco cheaper than HardiePlank®? In terms of cost, Stucco is considered more cost-effective than other types of cladding but it’s important to note the reasoning behind this. 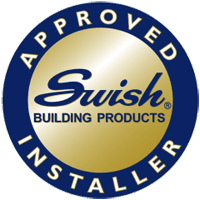 The low expense of stucco literally comes at a price, requiring professional installation, it needs regular maintenance and can be damaged fairly easily too. HardiePlank® vs Stucco – which cladding material comes out on top? The main drawback of Stucco is that it doesn’t hold up well under extreme climate conditions, e.g. moisture, ongoing settling issues, sinking ground, earthquakes, etc. Particularly prone to shrinking and splitting, poorly installed Stucco can also cause serious moisture issues by trapping excess moisture within the structure, which, more often than not, results in troublesome staining, cracking and mould. With Hardieplank®, you never have to worry about any of these issues. Considerably tough, Hardieplank® is also incredibly versatile; complimenting both classic and contemporary properties alike. Repelling the majority of hazards, Hardieplank® is very low maintenance and can also be repainted with ease when a new aesthetic is needed. 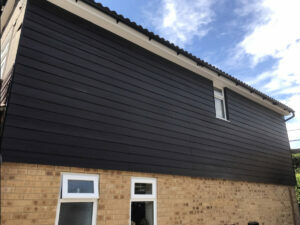 Looking great on its own or combined with other cladding finishes, HardiePlank® cladding hides unsightly imperfections whilst smoothly increasing energy efficiency & kerb appeal. Get in touch with a Fascia Solutions expert to discuss your cladding options further, we also offer fascias, soffits, bargeboards, and guttering.